The Maritime Academy at Shepherdson College in Galiwin’ku is preparing students for employment while equipping them with confidence, responsibility and respect. Seven students are currently undertakingRecreational Boating, which is being offered as part of the Employment Pathways curriculum and is the precursor to undertaking VET qualifications in a Certificate II in Marine Operations. Maritime Academy Teacher David Freier said the students from Years 9 and 10 completing the program were learning the skills needed for real-life employment in industries that were relevant to their community. “The great thing about the Employment Pathways curriculum is that it has enabled remote schools to focus on programs that fit into the local context and are important to students and the community,’’ he said. Mr Freier said the Maritime Academy had provided students with the opportunity to experience and learn new things outside of their normal possibilities. “It’s such a different experience and program,’’ he said. “In one excursion, we circumnavigated the island and in the lead-up the kids had to do all the measurements, use electric and paper aids, organise who was driving what legs and how much fuel we would need. They loved it. 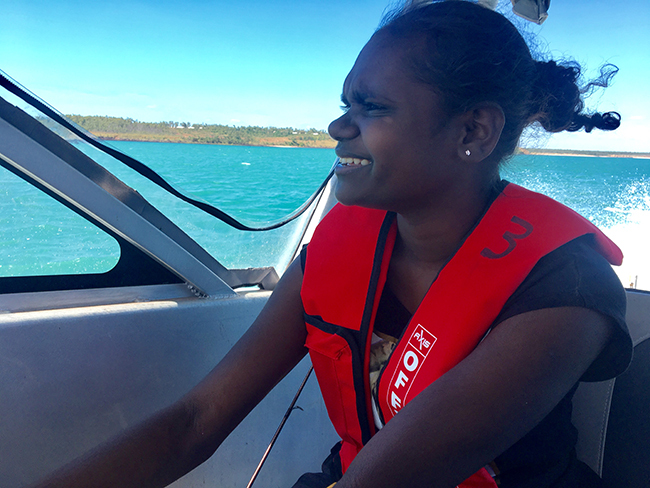 The Recreational Boating Course at Shepherdson College started in April this year and is also being offered as part of the Employment Pathways curriculum at Yurrwi School and Nhulunbuy High School. Mr Freier said the final assessment of the year would be a collaboration between the three Arnhem Land schools, with students navigating their way from Galiwin’ku to Nhulunbuy in convoy. “It’s been challenging but it’s pretty exciting. One of the main things has been watching the confidence of the kids increase; they enjoy it and it’s great to see them going home smiling,’’ he said. Employment Pathways provides an alternative curriculum for students in remote Aboriginal communities to gain employment and Vocational Education and Training (VET) qualifications, while also learning literacy and numeracy skills.